Well it took me long enough, but I can finally check this one off! You can see my almost two years' worth of progress shots over here. This is an exciting finish as its the largest quilt I've ever made! I know that because I ran out of binding, and I've never needed more than 8 strips before. I had more of the green solid, but I decided to keep that spot interesting and gave it a little Happy Go Lucky orange mum. Fabric: mix of reds, greens, oranges and a dash of grey from my stash. They are about 70% Bonnie and Camille, with some Riley Blake basics and other lines mixed in. The backing is Vintage Picnic wide grey check, and the border and binding are from the Miss Kate line. 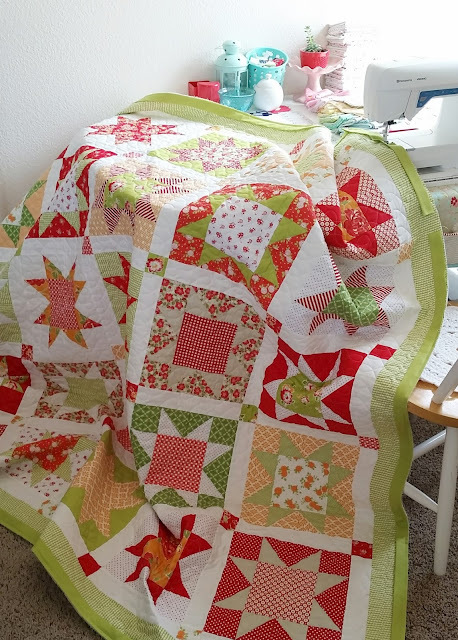 Pattern: I did not follow a specific pattern, but the stars are 12" square, the sashing is 2" finished, and the border is 3.5"
Quilting: by Julie Hirt in modern loops. Thanks again Julie!! Well done!! It's beautiful, and you finished it! It's a great accomplishment and you should be proud! Now off to start or finish another!! Love your quilt! I've accumulated some Moda scrap bags with same colors in them. I may need to see if I can make a star a day! The colors are so fresh, I like it very much. I hope you will be able to grow something outside without it being eaten. What a beautiful finish!! This quilt is gorgeous and the quilting on it is perfect. Loved the story behind the start of this quilt :)! So glad the voles are gone - they are awful!! Just beautiful! And I love that little binding interest! This finish turned out beautifully. The grey checks are perfect for the backing. I love it more after seeing some close ups! We are planting a garden this year for the first time in forever and I'm learning so much about natural pest control and it's interesting. Hope your unwanted bugs are gone for good cuz fresh veggies are wonderful! Love this quilt! So fresh and summery. 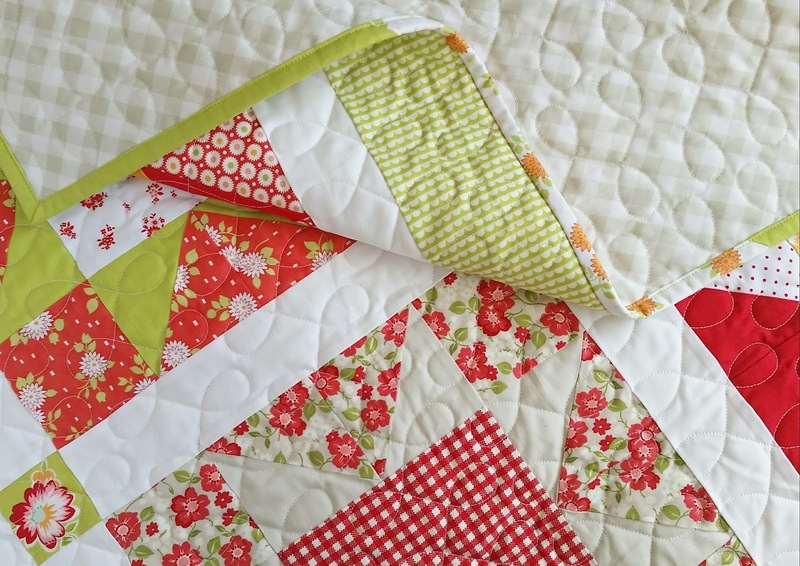 Wow, fabulous dquilt and your fabric combo caught my eye,so yummiest!! You are GOALS... Not just your absolutely beautiful quilting/sewing, but your beautiful life and spirit! Every single time I come to your site or IG, I am taken aback with your incredible ethos. You radiate love and positivity. Congratulations on the big finish - it's perfectly lovely! That is one of the nicest things anyone has ever said to me. Thank you so much Laura! Such a pretty quilt Alli! I'm so glad the voles are gone! Little buggers!